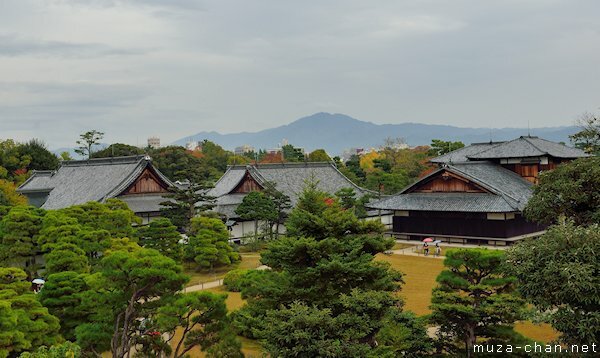 Renowned today for its spectacular Ninomaru and Honmaru palaces, the Nijō castle in Kyoto was in the beginning a typical castle, with an imposing main tower (tenshu in Japanese). However in 1750, 124 years after it was built, the tenshu was destroyed in a fire caused by lightning. Because a tenshu was a purely military construction and at the time Japan was in the middle of the Edo period, an era of peace, the tower was never rebuilt. All that is left today is the elevated stone foundation, a place arranged today to serve as an observatory for the surrounding garden. Here’s a photo taken from the former main tower foundation, with the Nijō Honmaru garden and palace.